Save money and time with Paton Hay Feeders – 30% less wastage than ground feeding. Paton – We deliver free to most regional areas. Just ask us today. Paton specialise in producing quality stock feeding equipment. Paton supply a wide variety including hay feeders, lick feeders, mobile feed stations, chicken feeders, trail feeders, feed out bins and more. Click below to view our full range. Click the link to download our Product Guide for 2019. If you’re feeding and been hearing about portions control from feeder companies check out this video from Nick that dispels some of the myths about lick feeders and portion control. The Paton system of feed doors on our lick feeders has been proven by producers for years. Simple, Proven, Reliable and low maintenance are the keys to successful feeding, plus the ability to deal with almost any ration type. Want to know more? Talk to Paton today, or one of our distributors in a town near you. Please view our instructional and informative videos on our products including a testimonial from a Victorian Sheep Farmer. Paton’s have been providing Australian Farmers with practical, innovative and cost effective feeding solutions for over 55 years. A trusted brand, renowned quality. Takes the backbreaking work out of lifting livestock. Trail Feeders save time and money. Take a guided tour around one of our ultra reliable and highly functional FeedKing 2.5 Tonne Feed Carts. 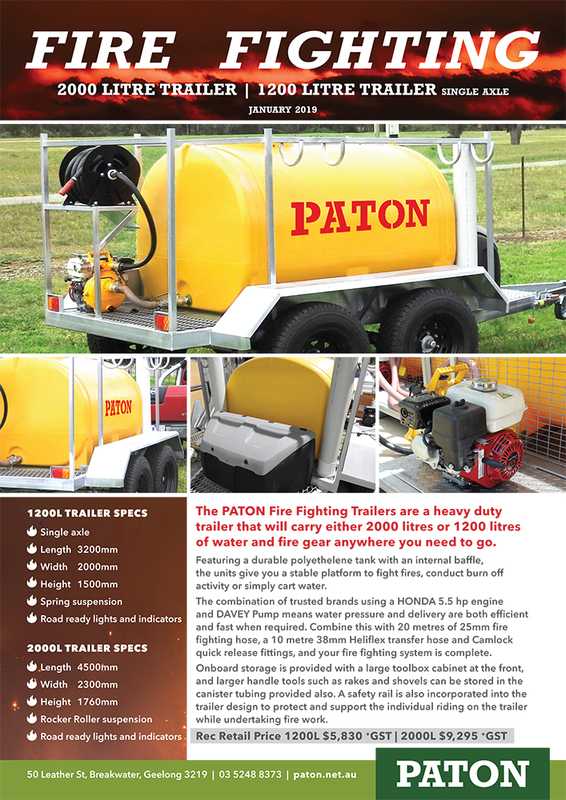 New from Paton – the fire fighting range.